Valle Aurina is a true winter wonderland, especially for all those who expect more from winter than just snow. Here, complete peace and tranquillity await you, allowing you to become one with nature. What could be more beautiful than merging with your surroundings and letting the mountain panorama on the sunny side of the Zillertal Alps wash over you? 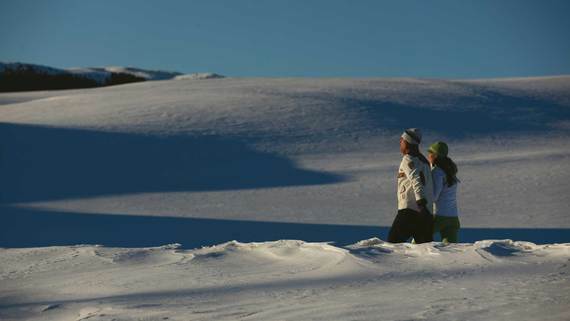 If you enjoyed the summer hikes in Valle Aurina, you’ll love the winter ones, too! 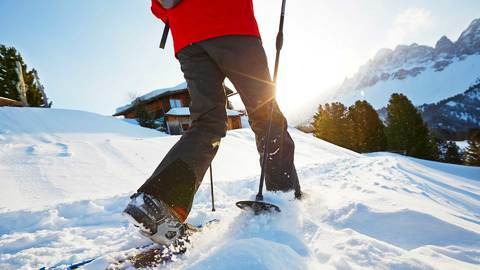 Trudging through glorious white landscapes on snowshoes and leaving tracks in the snow can become the ultimate winter experience for guests of all ages. This is precisely why the Stocker Alpine Hotel offers weekly guided snowshoe hikes, bringing you to the most beautiful locations in the Vedrette di Ries-Aurina natural park. Of course, you may borrow the necessary equipment directly from us at the hotel. Plus, if you need to warm your cockles during your day out, the rustic Alpine shacks that are, for the most part, dotted along the paths you’ll take come highly recommended.